Note for new subscribers (and reminder to others) Whenever you get an email update of a new post its better to click on the blue link above in your email that is the name of the post, for instance in this post where it says “Holy Semana Santa!!!”. That will take you to the actual website where it is better to view the post than from in your email inbox. So my last post left me in Manizales, sitting in the rain and trying to make a plan for the approaching Semana Santa religious holiday. Two days before the beginning of Semana Santa I still had no plans. There were a few places I would have liked to go but the mudslides from all the recent rains had closed several highways and eliminated a lot of my options. 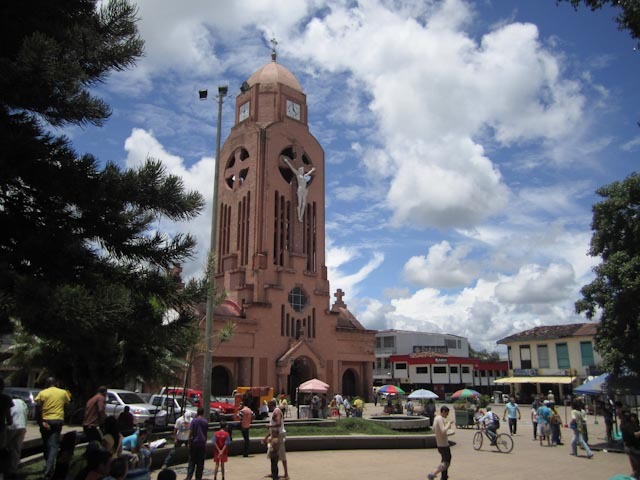 So I just decided to take a tour of “Small Town Colombia” and to spend half of Semana Santa in a small town called Quimbaya and the other half in an even smaller town called Filandia. Neither are in any guidbooks and I had not met any travelers who had been to either town, so it was to be a nice off-the-beaten-path adventure. I’ll keep the narrative short but I will say that I made a good choice. It was so nice to be in some small local towns, not a hostel or a gringo in site, but plently of friendly locals. Both towns had some nice charm but Filandia, the smaller of the two (population 7,000) was my favorite. In both towns the locals gathered in happy hourds around the central plaza as if it were the Kaaba at Mecca. The sun came out for the first time in weeks and I spent almost all my time sitting in the plazas, lazily content in people watching. With the holiday from work, the coming together of families, and the recently emerged sun, there was lots of good energy in the air and it felt nice to spent time observing the whole ordeal. The plazas were always full of vendors selling food and ice cream, sometimes there would be music, and always lots of kids running around playing. 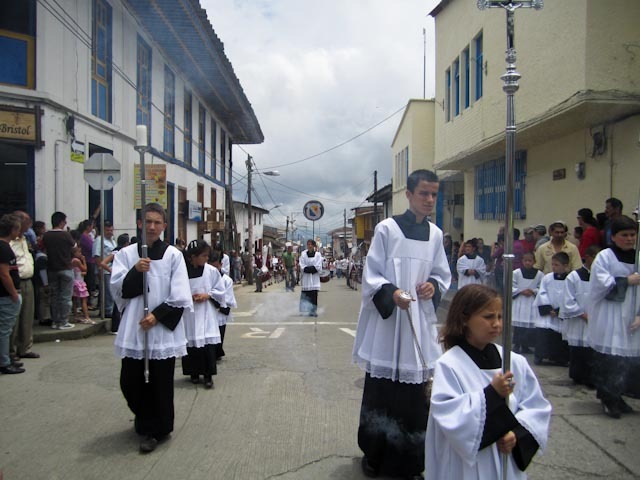 Once or twice a day a mass would take place at the church on the central plaza and preceding and/or proceeding the mass there was always a “Procesión”, a procession that always started and/or ended at the church. 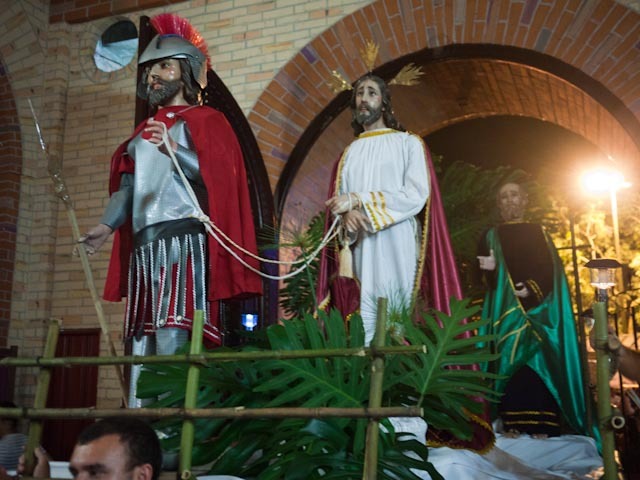 A mass of people would, somewhat solemnly, walk through the streets of the town following statues of Jesus, Mary Magdalen, The Virgin Mary, and other biblical characters as they were led down narrow streets accompanied by high school marching bands and church officials. Jesus being led out of the church to make his 3rd appearance in a procession that day. After Semana Santa I headed back to Bogota where I planned to regroup with my friend Silvia and head to Santender, another region of Colombia. The bus ride was supposed to be 7 hours but do to mechanical problems (we had to change busses twice) it took 11 hours. Status quo? 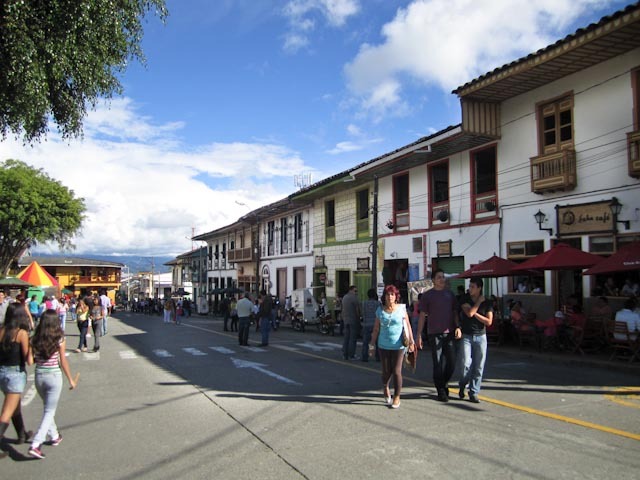 So I hung out in Bogota for a week, made a plan and took off to Santender where adventures in fossils, colonial towns, edible ants, and “international” nature walks awaited me. Coming soon. To see more photos (some have descriptions that will explain the story behind them) from Semana Santa click here: More Photos From Semana Santa. 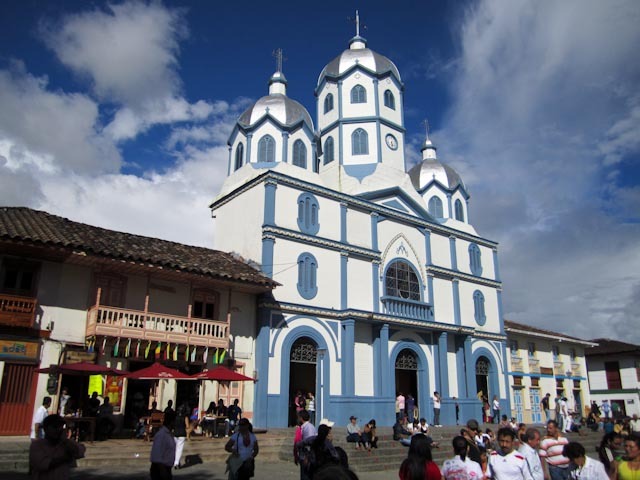 This entry was posted in Uncategorized and tagged backpacking, Coffee region, Colombia, columbia, Filandia, Holy week, Quimbaya, Quindio, religion, religious, Semana Santa, small town, South America, travel, traveler, traveling, Zona Cafetera on June 3, 2011 by Jordan.